A lawn problem may develop at any time. The four most common lawn issues are: soil issues, problems with water and irrigation, mowing problems, and insects and disease. Fortunately, there are solutions to these problems for improving your turf health. If you cannot handle these issues on your own, ask for help from a local landscape professional to solve your lawn problem. 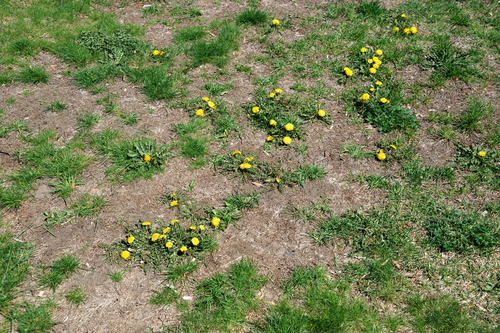 If your lawn is slow growing and yellow, then you need to boost nutrient levels in the soil. A simple test will give you the information you need so that you can adjust the pH levels if you have problems with acid or alkaline dirt. Soil compaction is another problem that causes thin grass growth and poor rooting. Lawn reconstruction is needed to solve compaction. Sometimes your lawn shows that it is either getting too much water or not enough. Excessive watering promotes root rot, deprives the roots of oxygen, and stunts growth. Under-watering causes wilt, stresses the grass, and weakens it. Mowing height is an issue for some people. You should never scalp your lawn. In hot and dry weather, mow your lawn at 2-3 inches. Do not remove more than one third of the grass blade per cutting so that you will not stress the turf. Leave the clippings and make sure your mower blades are sharp for healthy grass. If you notice pest damage, you will need to apply an insecticide. You can find evidence of disease by looking at circular patches in your lawn for thinning (or dead) grass in irregular areas. Mowing when grass is dry, landscaping to allow for air circulation, and collecting clippings if you have fungus in your lawn are all practices for managing or eliminating disease.